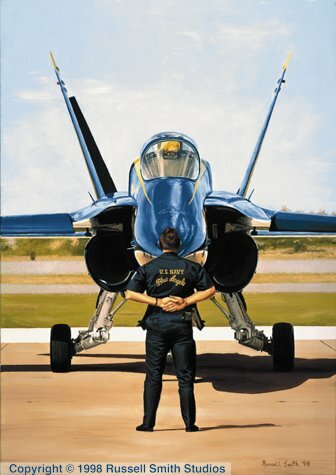 Face Off is an image that captures the crisp precision of the U.S. Navy Blue Angels. Russell came up with the idea for this piece while at a Blue Angels show several years ago. "I was standing in a spot that put me directly in line with one of the aircraft and its ground crewman. I thought that the juxtaposition of the crewman in front of the plane and the symmetry it created well summed up the precision of the display." Printed on acid free stock with fade resistant inks, the print is signed by Russell Smith.